Your child is now becoming increasingly fluent with mental calculations such as addition and subtraction facts and times tables. These ideas will help your child practise these skills in everyday life, and to learn to apply their maths skills and understanding. Use maths together at home. Most craft and DIY activities involve maths skills like measuring, calculating, understanding shapes and angles, multiplying, dividing, and so on. Model making, sewing and decorating are great for developing your child’s understanding and confidence. Perhaps your child would like to try making some simple clothes for a toy, or their own cardboard box mini-theatre? Prepare a meal together and ask your child to multiply or divide the quantities of ingredients in a recipe so it makes the right amount for your family. Can they measure all the ingredients and talk about grams, kilograms etc? Help your child to work out at what time things need to stop cooking. When you are out and about together, try playing simple verbal maths games. Spot a number plate and think of a calculation using those numbers. Ask the other person to work it out, or tell them the answer and see if they can work out the calculation. Or, have a quick round of ‘One Minute Brain Teasers’. There are also lots of games you can make or adapt at home, like bingo, snap and pairs with numbers, e.g. where you have to match a maths question to an answer. Games that involve racing, throwing, scoring, etc, will all build your child’s maths skills, as they often involve measuring, comparing, addition and subtraction. 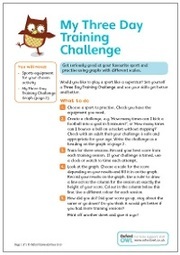 Practise dividing by 9 with these fun games. Use this poster to become a 6 x table whizz while you brush your teeth. Practise the 7 x table with a game of multiplication bingo. There are lot of opportunities to help your child with maths when you are out and about. Ask for your child’s help in adding up the shopping bill and working out change. Comparing prices, keeping a record of what you’ve spent and weighing food are all things that your child may be able to help with. Help your child to look out for and spot different shapes in the world around them. Remind them of the names for 2D and 3D shapes. Do they know that a football is a sphere, or that most tins of food are cylinders? Want to try an activity involving fractions? Try Cupcake Fractions and Fraction Match. Using and talking about simple charts and tables, like reward charts, timetables, or calendars, will help your child get used to how they work. Help them to make their own table or chart to gather information, e.g. the performance of a sports team, or the favourite pop groups in their class. Encourage your child to plan or record their own activities, as this will also help them to become familiar with creating and using charts and tables themselves.